Most people, I assume, when they think about gougères, envision far more romantic settings than I do. Cocktail parties, picnics in the French countryside, Parisian bakeries—that sort of thing. And why shouldn’t they? Gougères, those favoured puffs of cheese-enriched choux paste, are elegant and delicious, and somehow manage to be very impressive, although they are actually quite simple to make. The personal association that I have with gougères is, however, decidedly utilitarian. I first learned how to make them when I was attending pastry school, where we considered gougères to be in the same class as bread pudding and French toast—tasty and creative, of course, but most appealing to a thrifty chef because of their practicality. They were, in short, leftovers. This statement calls for a slight explanation. Whenever my pastry class was working with choux paste, after we had finished piping off the required number of éclairs, profiteroles, or swan-shaped pastries for the day, we would consolidate all of our remaining dough in a large bowl, toss in a pile of grated cheese and a few other flavouring agents, and make a big sheet pan of gougères. 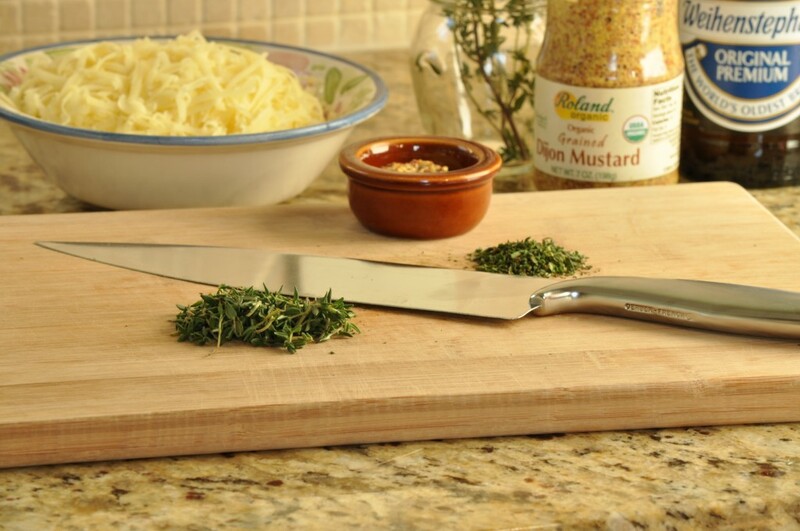 Since we were culinary school students, we liked to experiment with different combinations of cheeses and herbs if we could, but we also had a standard version that involved gruyère, Dijon mustard, and fresh thyme. This, too, was due to practical reasons. As the gougères were not really on the curriculum for that day, we had to make do with whatever flavouring agents we could get our hands on. Of the three cheeses that culinary schools always seem to keep in stock—chevre, gruyère, and grana padano (they can’t afford parmiggiano-reggiano)—gruyère is obviously the most suited to a French cheese puff. And since a good-sized wedge of it was usually up for grabs in the school commissary, that was what we used. There was always a crock of Dijon mustard in the commissary as well—I presume the culinary students used it for making vinaigrettes; I know the pastry class never used it for anything. (Well, except gougères.) The thyme came from the school garden: it was one of the few herbs that could be depended upon to yield bountifully. I always felt that this combination was the most appropriately French anyway, and it was my favourite. But then, after I left pastry school, I stopped making gougères very often. I don’t use much choux pastry at home, because of my mother’s egg allergy. After all, when you can make croissants and puff pastry and beautiful eggless chocolate cake, it seems rather inconsiderate to insist on baking eggy choux buns, no matter how marvellous they are. 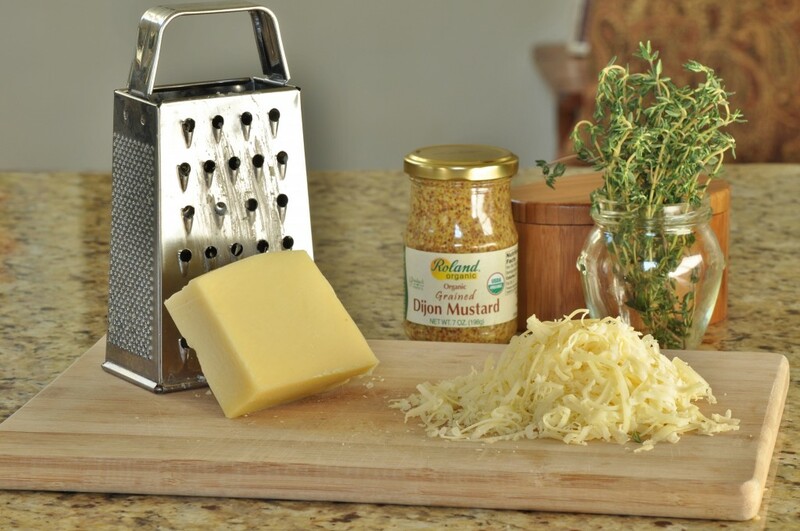 But I wanted to recapture that wonderfully savoury combination of sharp, nutty gruyère, tangy mustard, and sweet, woodsy thyme. 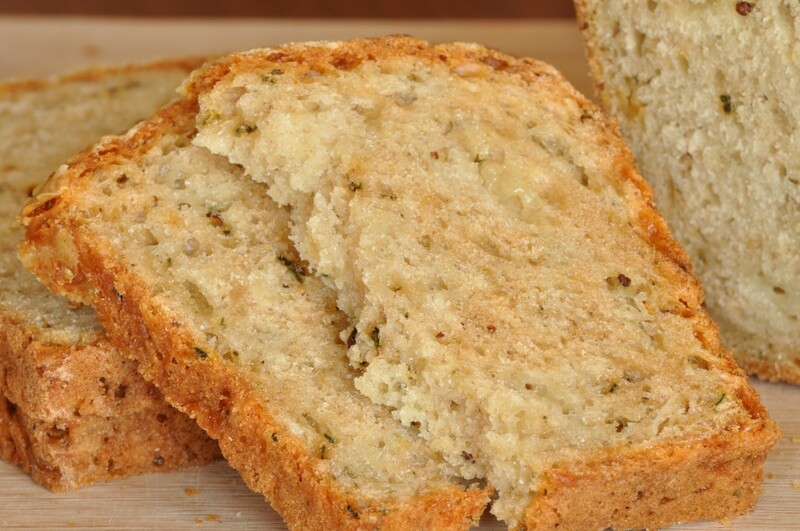 When I baked my first loaf of beer bread, I knew that I had finally found a perfect medium to showcase these flavours. 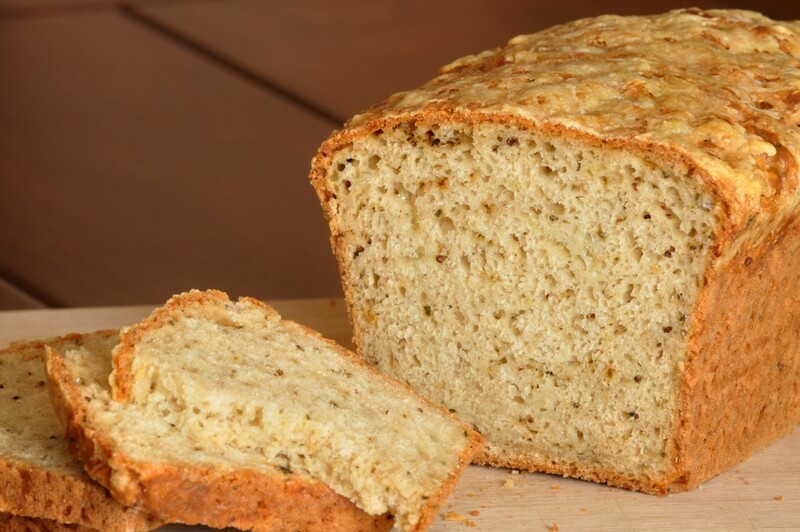 I think that this beer bread is miraculous to begin with—even though it is a quick bread, it still tastes yeasty—and it has a light, chewy texture that reminds me of choux pastry. I was very happy with how the bread turned out. It has a gorgeous crumb and cuts beautifully. 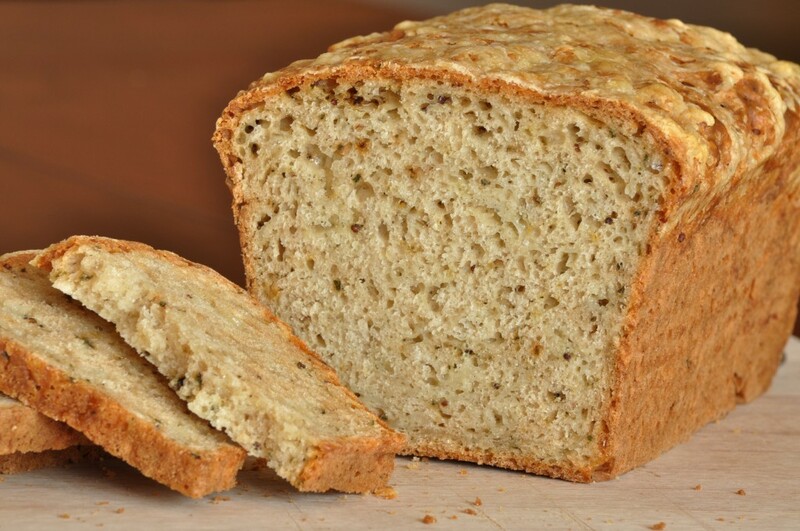 A lot of quick breads have a tendency to crumble when sliced thinly, but the beer seems to help tighten this bread’s structure (I think it has something to do with the acid and gluten), while also making it very airy and delicate. The combination of gruyère, mustard, and thyme is just right for this time of year, and marks the bread as an ideal candidate for turkey sandwiches. So, if you can, arrange to keep back one of those bottles of beer from the Thanksgiving football viewing, and then whip up a loaf of this bread the next morning for the ubiquitous day-after sandwiches. Because all leftovers deserve to be as delicious as gougères. Since this bread includes thyme, I am submitting it to the November Cooking with Herbs challenge, hosted by Karen of Lavender and Lovage. I don’t specify any particular kind of beer for this recipe. It’s really a matter of personal taste. If you want more of the cheese and herb flavours to come through, pick a lighter-style of beer. But if you don’t mind a little tang of beer in your bread, then chose a darker one. I like it both ways. Preheat oven to 375°F. Grease and flour a 9-x-5-inch loaf pan. In a large bowl, whisk together the flour, sugar, baking powder, baking soda, salt, and black pepper. Toss in the thyme and 4 ounces of the grated Gruyère. Open and measure out the beer. 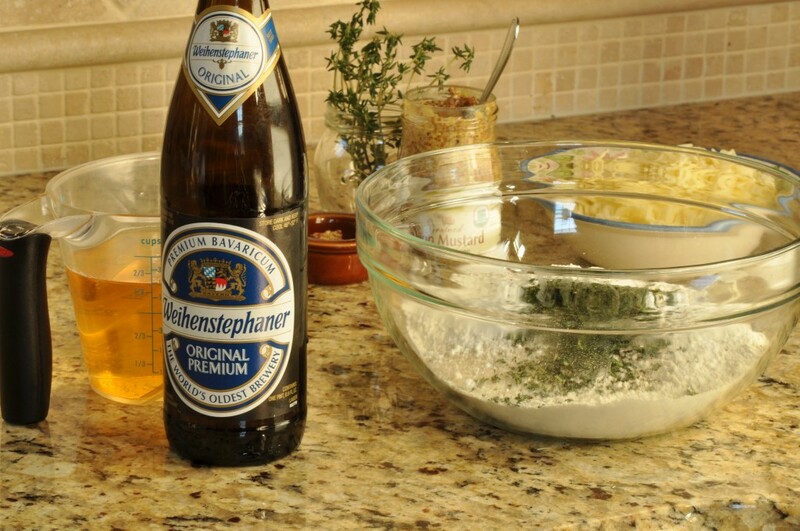 Whisk the mustard into the beer, and pour the mixture into the bowl with the dry ingredients. Stir just until the liquid is evenly incorporated and there are no dry spots remaining in the batter. Pour the batter into the prepared pan and spread it out evenly. 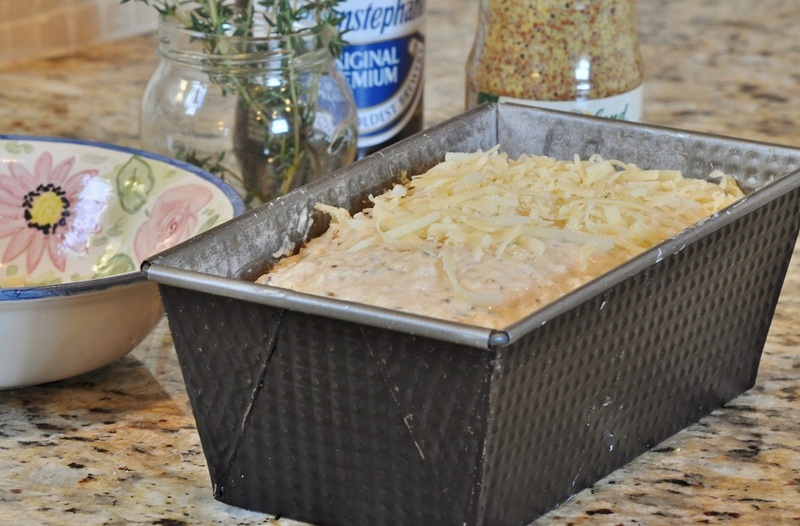 Sprinkle the remaining ounce of grated Gruyère over top. Bake until the bread is risen and golden, and a toothpick inserted in the center comes out clean, about 50 minutes. Transfer to a wire rack and let cool in pan for 10 minutes. Turn the loaf out of the pan and allow to finish cooling on the rack. Thank you, Karen. 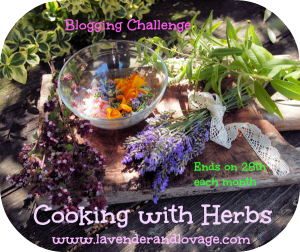 I love the Cooking with Herbs challenge–I hope that it will encourage me to bake with them more! I sometimes forget just how wonderful and varied the world of herbs can be.